An alien metal brought to Earth on the meteor that wiped out the dinosaurs could cure cancer, according to new research. Blasting it with a laser beam produces a poisonous form of oxygen that is deadly for tumour cells – and harmless for healthy ones. It could revolutionise treatment for the deadliest forms of the disease, say British scientists. Known as iridium, it’s the world’s rarest element. Experiments showed it penetrates the nucleus of cancer cells by latching onto the blood protein albumin. It becomes toxic only when exposed to light – an existing treatment known as photodynamic therapy. This activates the metal to kill them through ‘oxidisation’ – where the cells’ own oxygen is converted into a lethal form. Vitally, healthy tissue is unaffected. 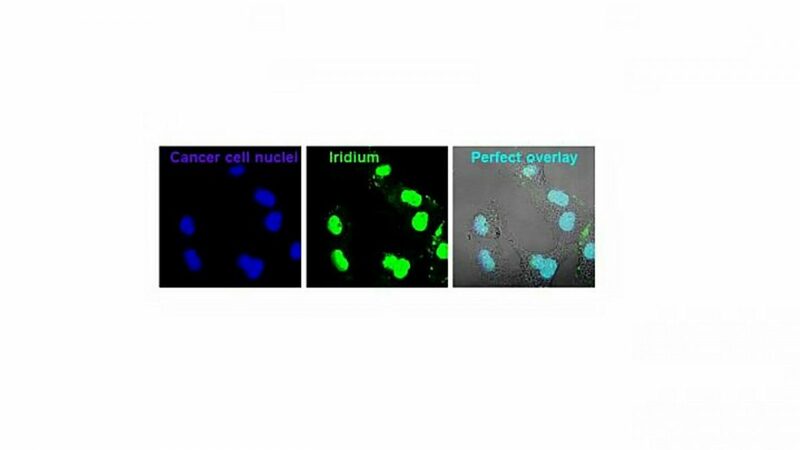 “It’s amazing this large protein can penetrate into cancer cells and deliver iridium which can kill them selectively on activation with visible light. He said it can be applied locally – and in smaller doses. The next step is pre-clinical animal trials. His international team used a special organic coating to hook up iridium to albumin – which then glowed very brightly. Under powerful microscopes they tracked its passage into lung cancer tumours grown in the lab – and found it destroyed them. 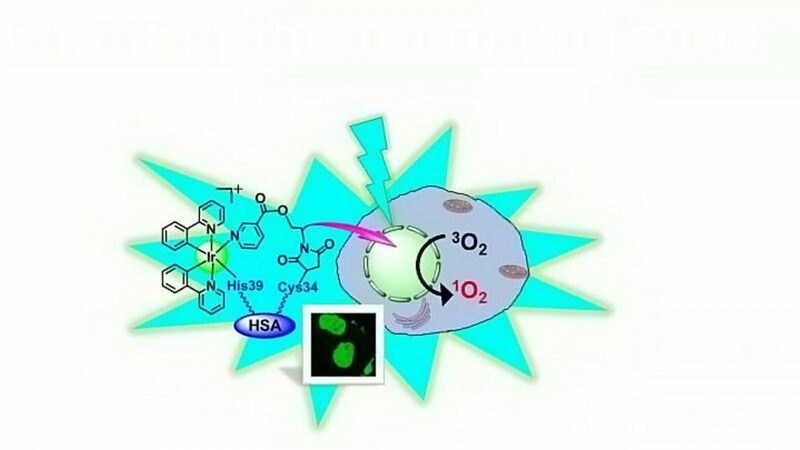 Photodynamic therapy is based on chemical compounds called photosensitizers that produce oxidising species when switched on by lasers. It’s already being used to treat a range of common cancers including those of the skin, breast and lung. When photosensitisers are exposed to a specific wavelength of light they produce a form of oxygen that kills nearby cells. Clinicians can target them to specifically attack cancer cells using thin, flexible tubes called optical fibres that carry light signals. The study published in Angewandte Chemie International Edition found the iridium based compound is an excellent photosensitiser. What is more albumin was able to deliver it right into the nucleus of cancer cells – which contains all the genetic material. The dormant iridium can then be turned on by red laser light irradiation – destroying them from their very centre. 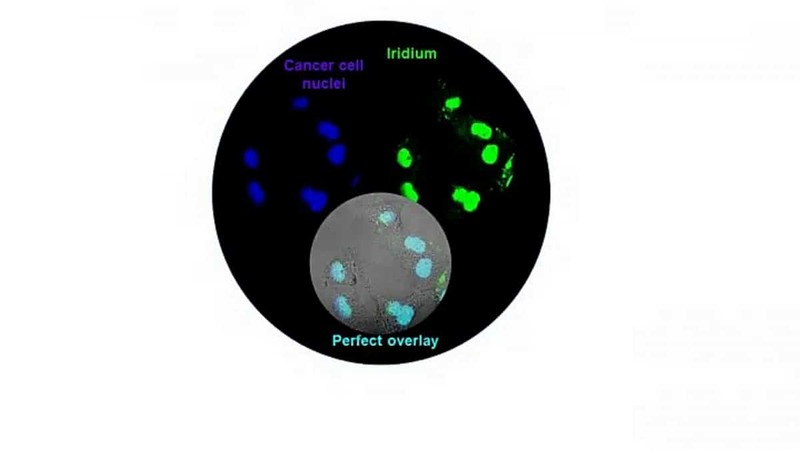 The bright luminescence of the iridium allowed its accumulation in the nucleus of tumours – and its activation leading to the death of cells – to be followed in real time. Co-author Dr Cinzia Imberti, also from Warwick, said: “It’s fascinating how albumin can deliver our photosensitiser so specifically to the nucleus. The idea is when light is shone onto tumours through the skin the compound will effectively kill tumours – leaving healthy cells untouched. With cancer becoming resistant to certain treatments it’s crucial to find other methods such as this. The compound damages proteins that manage heat shock stress and glucose metabolism – crucial molecules for cancer’s survival. Iridium landed in the Gulf of Mexico 66 million years ago on the massive seven mile wide space rock that killed off 70 percent of living species – including the dinosaurs. Laser-based techniques are emerging as viable treatments for cancer – targeting tumours far more precisely than the shotgun blast of radiation and chemotherapy. The brittle silvery-white metal has no effect on non-cancerous tissue – indicating it’s a highly targeted treatment that doesn’t attack healthy cells. It’s found in the world famous Chicxulub crater underneath the Yucatan Peninsula caused by the asteroid strike believed responsible for the death of the dinosaurs. The precious metal platinum is already used in over half of cancer chemo-therapies. Prof Sadler believes other precious metals like iridium – that are safe with minimum side-effects – can potentially combat resistance.